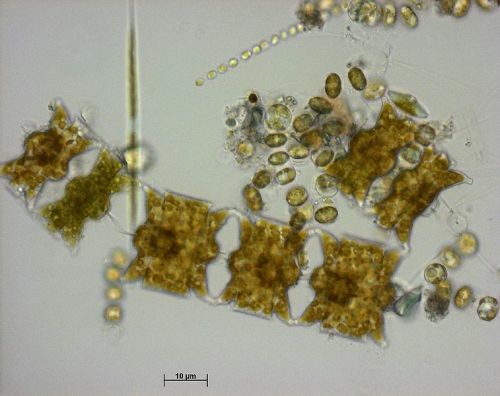 UXBRIDGE, Canada, May 8 2012 (IPS) - Without major reductions in the use of fossil fuels, sunlight is to kill an unknown number of ocean phytoplankton, the planet’s most important organism, a new study reports this week. Q&A: "Urgent CO2 Cuts Critical to Save Our Oceans"
The good news is this has slowed the rate of global warming. The bad news is oceans are now more acidic and it will get worse as more CO2 is emitted. This is basic, well-understood ocean chemistry. Gao and his team made several trips into the South China Sea taking samples from surface waters where phytoplankton are found. While still on the research vessel, those samples were made as acidic as the oceans are likely to be in 2100 without major emissions reductions (800-1000 parts per million compared to current 392 ppm). As expected under these conditions, certain types of plankton like coccolithophores did not do well but surprisingly, diatom productivity also declined. One possible reason was the much brighter natural light on the ship versus that in science labs, Riebsell and Gao suspected. Followup lab experiments with lights mimicking the intensity of natural light in the subtropical zone of the South China Sea confirmed that the combination of high-acid sea water and light intensity was more than diatoms could handle. Riebsell speculates that diatoms stressed by high-acid conditions can’t cope with the energy they receive from sunlight at the same time. Their study was published May 6 in Nature Climate Change. “We don’t know at what point the combination of a certain level of ocean acidity and sunlight leads to the decline of diatoms,” he said. This is just one of many recent studies finding negative impacts as the oceans become more and more acidic. By 2040, most of the Arctic Ocean will be too acidic for shell- forming species including most plankton. Significant areas of the Antarctic Ocean will be similarly affected, oceanographer Carol Turley from Plymouth Marine Laboratory in the UK previously told IPS. The cold waters of the polar regions allow more CO2 to be absorbed faster, turning the oceans more acidic sooner. The oceans haven’t seen a rapid change like this in 60 million years, said Turley. She warned that global warming is also raising water temperatures and reducing the amount of oxygen in seawater in some regions. This is another potentially dangerous combination. “Our research suggests the impact of oceanic acidification upon marine plankton could be more serious than previously thought,” said John Beardall from the School of Biological Sciences at Monash University. Beardall and colleagues from several research centres calculate that without major reductions in CO2 emissions, ocean acidity will have a significant impact on phytoplankton before 2100. Their findings were also recently published in Nature Climate Change. It’s not just plankton. The large and continuing decline of oysters, both wild and farmed, in the Pacific Northwest have now been linked to increased ocean acidity. Scientists have shown that oyster larvae have difficulty building shells in corrosive waters, according to a study in the journal Limnology and Oceanography published last month. “For the oceans, the Pacific Oyster larvae are the canaries in the coal mines for ocean acidification,” said Richard Feely, a co-author of the study and senior scientist at the National Oceanic and Atmospheric Administration. Fish and other species are showing changes in their growth, behaviour and reproduction, according to other research. Not only are the oceans big, covering 70 percent of the planet, they are complex. Recent work by the Scripps Institution of Oceanography at San Diego reveals there is huge variability in ocean acidity levels. That makes “global predictions of the impacts of ocean acidification a big challenge,” said Jennifer Smith, a marine biologist with Scripps. The only prediction Riebesell is willing to make is about the high likelihood of a major decline in the ocean’s biodiversity (number and types of living things) if rates of fossil fuel emissions continue. Roughly 80 percent of all life is found in the oceans.